There are few things better than thanking people who move our mission forward. Actually the only thing better may be finding really fun ways to thank people! And our Walk to End Alzheimer's Champions deserve only the best! What is a Walk to End Alzheimer's Champion? An individual who individually raises $500 or more for Walk to End Alzheimer's. Last year was the first year we started recognizing members of the Champions Club, due to the popularity and the enormous commitment Walkers make, we created the GRAND Champions club - individuals who raise $1,000 or more! Champions receive a medal on Walk day, and GRAND Champions receive a medal AND a really awesome Grand Champion t-shirt! Check our community calendar for upcoming events near you, click here! We NEED YOU! to volunteer in our Charleston office! Have a few hours during the week to help answer phones and light computer work? Send us an email at wvinfo@alz.org! Still haven't registered for Walk? That was four bullets ago!! Get on it -> click here! No, this is not a recipe this week. But, I have to share! A few years ago W gave me a KitchenAid mixer for Christmas, which I use weekly. I also received a number of attachments, including a meat grinder. 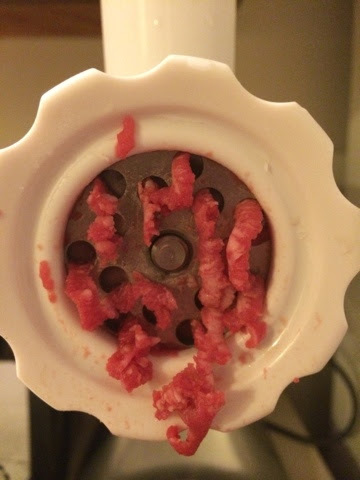 I will admit, the meat grinder sat dormant for quite some time in the corner of my kitchen - until recently. It is truly my new addiction. The first night I hooked it up, we ground a chuck roast to make hamburgers. THE most amazing hamburgers you could imagine. Light, juicy, flavorful. Not to mention, after a stressful day, grinding up a hunk of meat provides a little bit of relief!